(2) Persons 18 years of age or over who possess more than 28.5 grams of marijuana, or more than four grams of concentrated cannabis, or both, shall be punished by imprisonment in a county jail for a period of not more than six months or by a fine of not more than five hundred dollars ($500), or by both such fine and imprisonment. (d) Except as authorized by law, every person under the age of 18 who possesses not more than 28.5 grams of marijuana, or not more than four grams of concentrated cannabis, upon the grounds of, or within, any school providing instruction in kindergarten or any of grades 1 through 12 during hours the school is open for classes or school-related programs is guilty of an infraction and shall be punished in the same manner provided in paragraph (1) of subdivision (b). 11358. Planting, Harvesting, or Processing. 11360. Unlawful Transportation, Importation, Sale, or Gift. (D) The offense involved the import, offer to import, or attempted import into this state, or the transport for sale, offer to transport for sale, or attempted transport for sale out of this state, of more than 28.5 grams of marijuana or more than four grams of concentrated cannabis. (b) Except as authorized by law, every person who gives away, offers to give away, transports, offers to transport, or attempts to transport not more than 28.5 grams of marijuana, other than concentrated cannabis, is guilty of an infraction and shall be punished by a fine of not more than one hundred dollars ($100). In any case in which a person is arrested for a violation of this subdivision and does not demand to be taken before a magistrate, such person shall be released by the arresting officer upon presentation of satisfactory evidence of identity and giving his or her written promise to appear in court, as provided in Section 853.6 of the Penal Code, and shall not be subjected to booking. (a) Every person 18 years of age or over who hires, employs, or uses a minor in unlawfully transporting, carrying, selling, giving away, preparing for sale, or peddling any marijuana, who unlawfully sells, or offers to sell, any marijuana to a minor, or who furnishes, administers, or gives, or offers to furnish, administer, or give any marijuana to a minor under 14 years of age, or who induces a minor to use marijuana in violation of law shall be punished by imprisonment in the state prison for a period of three, five, or seven years. (2) Free to participants, and the drug education provides at least four hours of group discussion or instruction based on science and evidence-based principles and practices specific to the use and abuse of marijuana and other controlled substances. 11361.5. Destruction of Arrest and Conviction Records; Procedure; Exceptions. (a) Records of any court of this state, any public or private agency that provides services upon referral under Section 1000.2 of the Penal Code, or of any state agency pertaining to the arrest or conviction of any person for a violation of Section 11357 or subdivision (b) of Section 11360,* or pertaining to the arrest or conviction of any person under the age of 18 for a violation of any provision of this article except Section 11357.5, shall not be kept beyond two years from the date of the conviction, or from the date of the arrest if there was no conviction, except with respect to a violation of subdivision (d) of Section 11357, or any other violation by a person under the age of 18 occurring upon the grounds of, or within, any school providing instruction in kindergarten or any of grades 1 through 12 during hours the school is open for classes or school-related programs, the records shall be retained until the offender attains the age of 18 years at which time the records shall be destroyed as provided in this section. Any court or agency having custody of the records, including the statewide criminal databases, shall provide for the timely destruction of the records in accordance with subdivision (c), and such records must also be purged from the statewide criminal databases. As used in this subdivision, “records pertaining to the arrest or conviction” shall include records of arrests resulting in the criminal proceeding and records relating to other offenses charged in the accusatory pleading, whether defendant was acquitted or charges were dismissed. The two-year period beyond which records shall not be kept pursuant to this subdivision shall not apply to any person who is, at the time at which this subdivision would otherwise require record destruction, incarcerated for an offense subject to this subdivision. For such persons, the two-year period shall begin to run from the date the person is released from custody. The requirements of this subdivision do not apply to records of any conviction occurring prior to January 1, 1976, or records of any arrest not followed by a conviction occurring prior to that date, or records of any arrest for an offense specified in subdivision (c) of Section 1192.7, or subdivision (c) of Section 667.5 of the Penal Code. Any person subject to an arrest or conviction for those offenses may apply to the Department of Justice for destruction of records pertaining to the arrest or conviction if two or more years have elapsed since the date of the conviction, or since the date of the arrest if not followed by a conviction. The application shall be submitted upon a form supplied by the Department of Justice and shall be accompanied by a fee, which shall be established by the department in an amount which will defray the cost of administering this subdivision and costs incurred by the state under subdivision (c), but which shall not exceed thirty-seven dollars and fifty cents ($37.50). The application form may be made available at every local police or sheriff’s department and from the Department of Justice and may require that information which the department determines is necessary for purposes of identification. The department may request, but not require, the applicant to include a self-administered fingerprint upon the application. If the department is unable to sufficiently identify the applicant for purposes of this subdivision without the fingerprint or without additional fingerprints, it shall so notify the applicant and shall request the applicant to submit any fingerprints which may be required to effect identification, including a complete set if necessary, or, alternatively, to abandon the application and request a refund of all or a portion of the fee submitted with the application, as provided in this section. If the applicant fails or refuses to submit fingerprints in accordance with the department’s request within a reasonable time which shall be established by the department, or if the applicant requests a refund of the fee, the department shall promptly mail a refund to the applicant at the address specified in the application or at any other address which may be specified by the applicant. However, if the department has notified the applicant that election to abandon the application will result in forfeiture of a specified amount which is a portion of the fee, the department may retain a portion of the fee which the department determines will defray the actual costs of processing the application, provided the amount of the portion retained shall not exceed ten dollars ($10). (5) Possess, transport, purchase, obtain, use, manufacture, or give away marijuana accessories to persons 21 years of age or older without any compensation whatsoever. (b) Paragraph (5) of subdivision (a) is intended to meet the requirements of subsection (f) of Section 863 of Title 21 of the United States Code (21 U.S.C. Sec. 863(f)) by authorizing, under state law, any person in compliance with this section to manufacture, possess, or distribute marijuana accessories. (c) Marijuana and marijuana products involved in any way with conduct deemed lawful by this section are not contraband nor subject to seizure, and no conduct deemed lawful by this section shall constitute the basis for detention, search, or arrest. 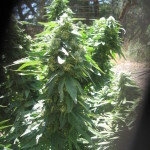 (2) The living plants and any marijuana produced by the plants in excess of 28.5 grams are kept within the person’s private residence, or upon the grounds of that private residence (e.g., in an outdoor garden area), are in a locked space, and are not visible by normal unaided vision from a public place. (b) (1) A city, county, or city and county may enact and enforce reasonable regulations to reasonably regulate the actions and conduct in paragraph (3) of subdivision (a) of Section 11362.1. (2) Notwithstanding paragraph (1), no city, county, or city and county may completely prohibit persons engaging in the actions and conduct under paragraph (3) of subdivision (a) of Section 11362.1 inside a private residence, or inside an accessory structure to a private residence located upon the grounds of a private residence that is fully enclosed and secure. (4) Paragraph (3) shall become inoperative upon a determination by the California Attorney General that nonmedical use of marijuana is lawful in the State of California under federal law, and an act taken by a city, county, or city and county under paragraph (3) shall be deemed repealed upon the date of such determination by the Attorney General. (1) Smoke or ingest marijuana or marijuana products in any public place, except in accordance with Section 26200 of the Business and Professions Code. (2) Smoke marijuana or marijuana products in a location where smoking tobacco is prohibited. (3) Smoke marijuana or marijuana products within 1,000 feet of a school, day care center, or youth center while children are present at such a school, day care center, or youth center, except in or upon the grounds of a private residence or in accordance with Section 26200 of, or Chapter 3.5 (commencing with Section 19300) of Division 8 of, the Business and Professions Code and only if such smoking is not detectable by others on the grounds of such a school, day care center, or youth center while children are present. (4) Possess an open container or open package of marijuana or marijuana products while driving, operating, or riding in the passenger seat or compartment of a motor vehicle, boat, vessel, aircraft, or other vehicle used for transportation. (5) Possess, smoke or ingest marijuana or marijuana products in or upon the grounds of a school, day care center, or youth center while children are present. (6) Manufacture concentrated cannabis using a volatile solvent, unless done in accordance with a license under Chapter 3.5 (commencing with Section 19300) of Division 8 of, or Division 10 of, the Business and Professions Code. (7) Smoke or ingest marijuana or marijuana products while driving, operating a motor vehicle, boat, vessel, aircraft, or other vehicle used for transportation. (8) Smoke or ingest marijuana or marijuana products while riding in the passenger seat or compartment of a motor vehicle, boat, vessel, aircraft, or other vehicle used for transportation except as permitted on a motor vehicle, boat, vessel, aircraft, or other vehicle used for transportation that is operated in accordance with Section 26200 of the Business and Professions Code and while no persons under the age of 21 years are present. (b) For purposes of this section, “day care center” has the same meaning as in Section 1596.76. (c) For purposes of this section, “smoke” means to inhale, exhale, burn, or carry any lighted or heated device or pipe, or any other lighted or heated marijuana or marijuana product intended for inhalation, whether natural or synthetic, in any manner or in any form. “Smoke” includes the use of an electronic smoking device that creates an aerosol or vapor, in any manner or in any form, or the use of any oral smoking device for the purpose of circumventing the prohibition of smoking in a place. (d) For purposes of this section, “volatile solvent” means volatile organic compounds, including: (1) explosive gases, such as Butane, Propane, Xylene, Styrene, Gasoline, Kerosene, O2 or H2; and (2) dangerous poisons, toxins, or carcinogens, such as Methanol, Iso-propyl Alcohol, Methylene Chloride, Acetone, Benzene, Toluene, and Trichloro-ethylene. (e) For purposes of this section, “youth center” has the same meaning as in Section 11353.1. (f) Nothing in this section shall be construed or interpreted to amend, repeal, affect, restrict, or preempt laws pertaining to the Compassionate Use Act of 1996. (a) A person who engages in the conduct described in paragraph (1) of subdivision (a) of Section 11362.3 is guilty of an infraction punishable by no more than a one hundred dollar ($100) fine; provided, however, that persons under the age of 18 shall instead be required to complete four hours of a drug education program or counseling, and up to 10 hours of community service, over a period not to exceed 60 days once the drug education program or counseling and community service opportunity are made available to the person. (b) A person who engages in the conduct described in paragraphs (2) through (4) of subdivision (a) of Section 11362.3 shall be guilty of an infraction punishable by no more than a two-hundred-fifty-dollar ($250) fine, unless such activity is otherwise permitted by state and local law; provided, however, that persons under the age of 18 shall instead be required to complete four hours of drug education or counseling, and up to 20 hours of community service, over a period not to exceed 90 days once the drug education program or counseling and community service opportunity are made available to the person. (f) Notwithstanding subdivision (e), a person under the age of 18 who violates the restrictions in subdivision (a) of Section 11362.2 shall be punished under subdivision (a) of Section 11358. (2) The drug education program required by this section for persons under the age of 18 must be free to participants and provide at least four hours of group discussion or instruction based on science and evidence-based principles and practices specific to the use and abuse of marijuana and other controlled substances. (a) Laws making it unlawful to drive or operate a vehicle, boat, vessel, or aircraft, while smoking, ingesting, or impaired by, marijuana or marijuana products, including, but not limited to, subdivision (e) of Section 23152 of the Vehicle Code, or the penalties prescribed for violating those laws. (b) Laws prohibiting the sale, administering, furnishing, or giving away of marijuana, marijuana products, or marijuana accessories, or the offering to sell, administer, furnish, or give away marijuana, marijuana products, or marijuana accessories to a person younger than 21 years of age. (d) Laws pertaining to smoking or ingesting marijuana or marijuana products on the grounds of, or within, any facility or institution under the jurisdiction of the Department of Corrections and Rehabilitation or the Division of Juvenile Justice, or on the grounds of, or within, any other facility or institution referenced in Section 4573 of the Penal Code. (e) Laws providing that it would constitute negligence or professional malpractice to undertake any task while impaired from smoking or ingesting marijuana or marijuana products. (f) The rights and obligations of public and private employers to maintain a drug and alcohol free workplace or require an employer to permit or accommodate the use, consumption, possession, transfer, display, transportation, sale, or growth of marijuana in the workplace, or affect the ability of employers to have policies prohibiting the use of marijuana by employees and prospective employees, or prevent employers from complying with state or federal law. So those under 21 no longer lose their license if charged with a 11357b infraction? The only penalty is a $100 fine?